Our free residential lots are located in the beautiful Prairie Estates, a new subdivision perfect for both families and retirees. The cul-de-sac, with six available lots, is paved. Nestled in the heart of the Smoky Hills, the charming atmosphere is perfectly complimented by easy access to the beautiful Wilson Lake, and city shopping just an hour away. 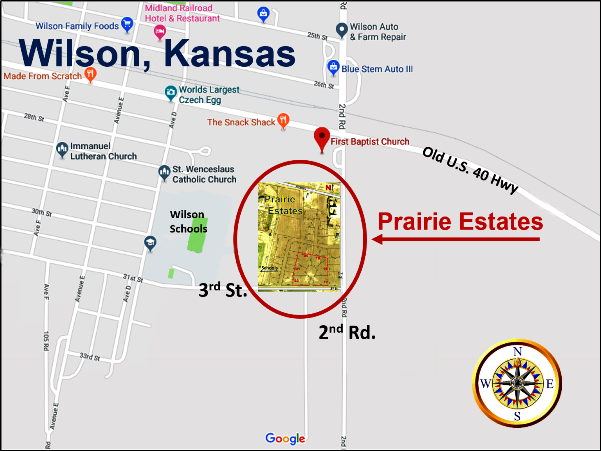 Wilson is host to a variety of businesses, churches, lodging, RV park, splash pad, disc golf, and of course, in the Czech Capital of Kansas, Wilson is also host to the famous "World's Largest Hand Painted Czech Egg! "​ With so much to see and enjoy, you'll want to CZECH us out! The minimum roof pitch must be at least 5" in 12"
If one lot is not enough space for your needs, a second, adjoining may be purchased. This would give you additional room for a larger yard, garden, garage, pool, outbuilding, etc. Contact us for available adjoining lots. While your lot is free, special assessments are charged for the water lines and streets in this new addition. Specials can be billed along with regular property taxes and spread over 10 years or paid in a lump sum at the time of building. There is no credit check or additional paperwork for the City of Wilson to finance these specials over a ten-year period.